So fair well Alianna, you have been a happy home and we wish you and your new owners as many happy adventures as we have had with you. We have been on Wandering Star nearly a month now. Settling in nicely and arranging all our belongings. 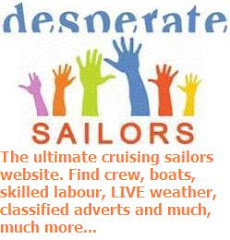 Now it’s time to get stuck into a jobs list before we can think about putting to sea. Some jobs are insurance requirements, others safety and others for comfort or been bought forward as we have guests in the form of my parents arriving next week. 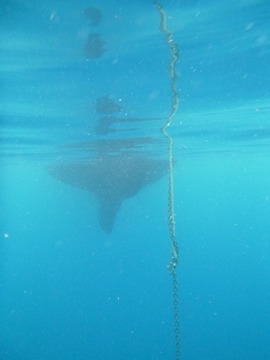 Davit Wire – The lifting wire on the davit has been replaced as requested by the insurance company. 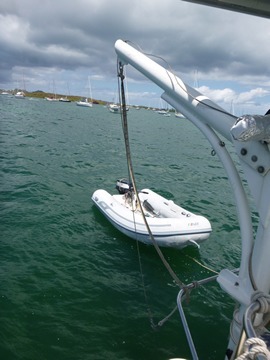 Wind Instrument Cable – The cable from the mast to the instruments in the cockpit needs to be re run as there was a fault in the wire and nothing was being displayed. The reading also needs to be recalibrated. 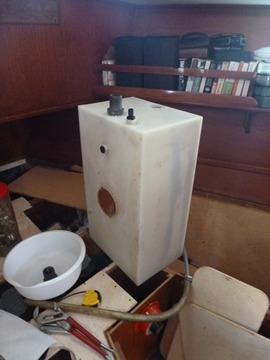 Repair Forward Toilet and Sink - The electric pump out needed overhauling and was leaking (not good on a steel boat) and the holding tank that the waste must pass through had a large crack in it (also not good!) Sim has spent the last week, over hauling, repairing and putting in new tanks so all should be in working order. The heads sink was also leaking and needed its drain replacing. None of these jobs were complicated just laborious and time consuming. Side Ports – All the side opening ports are sealed shut. 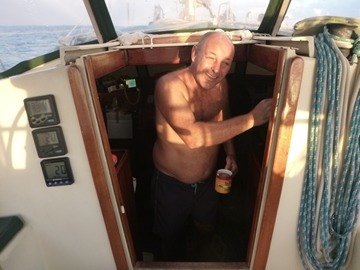 In most of the boat this is not a massive problem to deal with imminently but in the aft cabin where we can only open the main window a few inches because of the dinghy on deck it gets incredibly hot – it’s not like a forward cabin where a gale blows in. Sim and I have been sweltering at night. So we have taken one of the ports off in order to replace the seal – not a massive job one thinks….ahem! Famous last words. The window is painted aluminum and the paint is blistering and coming off – best to take it all off. A job that started 3 days ago and is still a work in progress. What kind of wallys get involved in painted metal boats? 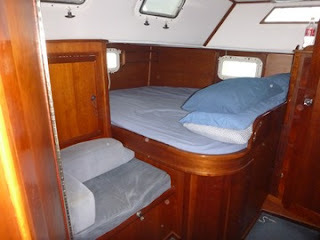 Aft Cabin Mattress – Our aft cabin mattress though very comfortable is falling to pieces and depositing huge amounts of disintegrated old foam about the place. It makes such a mess. We have investigated a new one, are a little shocked at the price but can get in done in 24 hours. So may go ahead with that. Or wait until Grenada and do it there. Brackets for Outboard and Gas Bottle – We have a 2.5 outboard and a 20lb gas bottle just lying (chained and padlocked) on deck. They need proper brackets to be secured for when we go to sea. 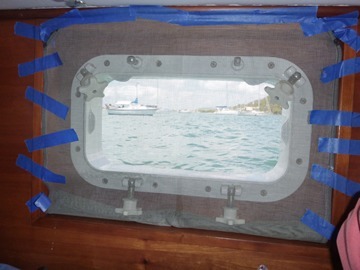 Chaff gear for dinghy – It’s a tight squeeze to fit the dinghy fore and aft between the back stay and the wind generator pole; it does fit but we need to add chaff gear to protect the dinghy from deteriorating rapidly. There are squillions of other big and little jobs and modifications that we want make to Wandering Star not to mention getting started on all the blistering painted aluminium and tackling the first of the rusty spots that are making their appearance. The lens of the nav lights need replacing, the inner stay furling gear needs over hauling, the wind generator isn't working. The list goes on and on. I don’t think you really appreciate how long it takes to get settled on a boat until you start all over again. I’m not familiar with any of the machinery and electronics. These are all new systems that we need to learn. 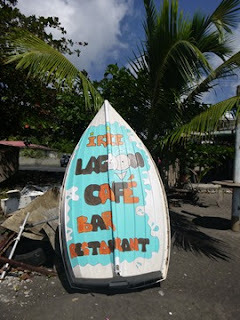 We need to trace all the plumbing and wiring systems and find out what goes where. 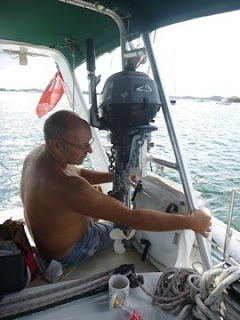 When the wind starts to pick up and I’m on my own I get a little jumpy…..will the anchor hold, will I start the engine correctly, will the electric (joy of joys) windless work? Because so far I have only done each of these items once instead of hundreds of times. I remember once an old man that lived in an apartment above a new flat that I just moved into, dropped a note through my door saying ‘it takes time to make new friends’. At the time I thought he was crazy. But it’s a phrase that I have thought about many times. He was telling me it’s going to take a while to build trust whether that is in people or boats or anything I guess it doesn’t really matter. Wandering Star is doing really well but it will be a while before she fully earns my trust. Sim and I have kept up a steady pace of work over the last couple of weeks. 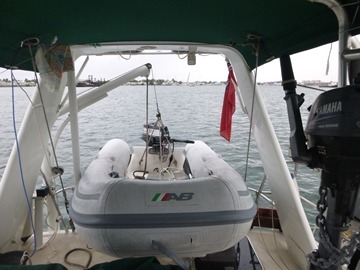 We kept the two boats rafted together until last Saturday to make the whole moving process a lot simpler. We are still absolutely astounded at how much stuff we have been able to carry around on Alianna and how little space Wandering Star has to offer. But it has been a cathartic process in the purging of all our unnecessary (and necessary) items – a process that is surely good for us. I mean, is it truly necessary to carry around enough pieces of wood to start a carpentry business or enough spares to fix a fleet of boats. We carried enough paper charts to navigate the Med, N America, the north coast of South America and the East and West Caribbean and discovered all sorts of pieces we never knew we had. As a couple we are hopeless at being minimalists despite our love of the simple life. So we lugged our unwanted goods along to the flea markets and advertised on the local radio net, we gave stuff away and chucked bag after bag into the skips. We are still packed to the brim on Wandering Star and still have stuff to stow away. But Alianna is looking great without all the clutter. In the mean time we have been catching up with friends old and new – meeting for dinner on people’s boats or drinks ashore at the popular cruisers hangout “Barnacles”. We haven’t had time to go exploring or for walks on the stunning Simpson Bay beach but hopefully we can start to relax over the next few weeks and take things at a slower pace. It’s not like me to not want to go ashore and stretch my legs but days fly by with all the sorting and before I know it almost a week has gone without my feet touching terra firma. 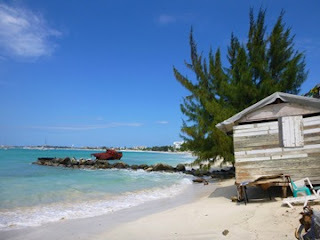 It’s been a week since we have moved aboard Wandering Star. 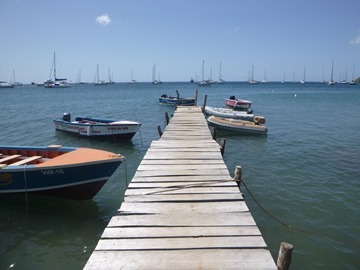 We put Alianna on a mooring so as not to have two boats to look after on anchor in the notoriously bad holding of Simpson Bay Lagoon. 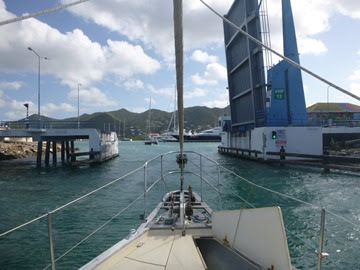 As the winds have been light we have rafted the two boats together to make the ease of moving more convenient. I don’t know how we would have managed if we hadn’t of done this. Glyn and Jenny the previous owners bought Wandering Star along side Alianna last Friday. 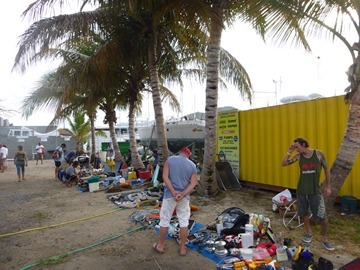 They walked away with only what they could carry and so we have been fortunate enough to go through all the spares, belongings and bits and pieces that go with full time cruising. It means that we are able to leave Alianna well equipped and ready to go. side by side our old love and our new. 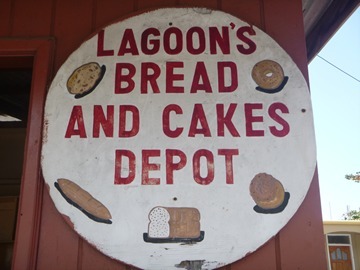 We always knew we carried a lot of “stuff” – all you need and beyond to be self sufficient. But I don’t think either of us realized quite how much we actually have. 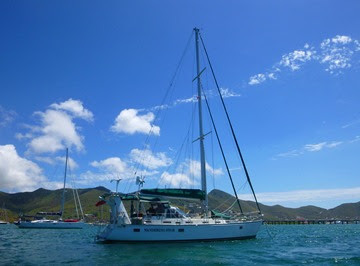 It brings me back again to just how much storage Alianna has on board for a 39ft sailing boat. We are struggling to fit everything in to Wandering Star. The spare cabin is piled high and every available space and locker has been filled…..and we still have more stuff to bring over. 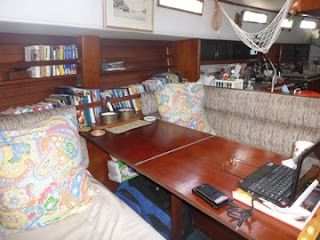 The aft end of the boat is full of bags to take to the boat jumble this weekend. Anything we can’t sell or give away will have to be chucked :-( - Throwing goof stuff out just kills me – one thing lacking in the islands are good thrift or charity shops. 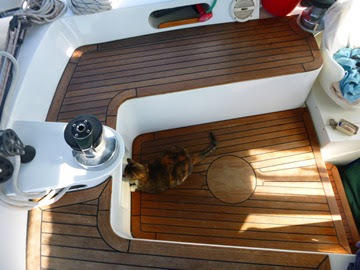 But Wandering Star is a beautiful boat; her saloon is large and airy. 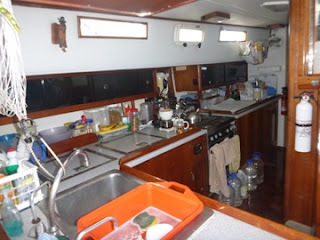 The galley is easy to use AND we have a seperate freezer….with ice cream in!! Joy of joys. Though it does drain a lot of battery juice. Overall we are absolutely thrilled with the new boat. It will take time to get her just so – heck I’d say it took us 8 years to get Alianna how we liked her. But we have the time to plod away slowly. 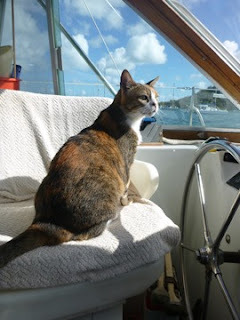 We need to learn all her idiosyncrasies that every boat has. Soon we will start to learn what the up keep of a steel boat involves. Although there is a lot of blistering in the painted Aluminum which we will start to tackle later this year the steel hull seems in good shape. Its funny how things never stay the same – rust is the new element in my life – everywhere I go (not including WS) I see rusty cars, rust streaked tanks…rust, rust, rust. 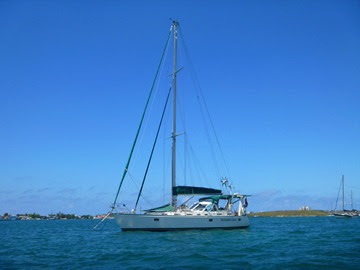 But we will work hard to keep her in tip top shape and in return she will be a safe and strong sailing boat. 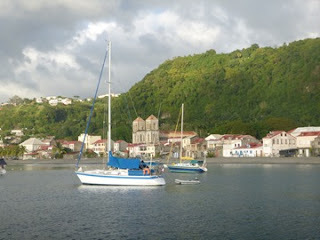 The day sail we had intend from Dominica to Deshaies in Guadeloupe turned into a night sail all the way up to St Martin. 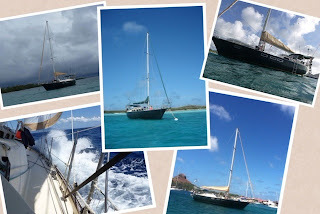 The winds were good and though it was a windward trip it wasn’t uncomfortable. We had an almost full moon all of the way, lighting the night sky. I have never been particularly fond of night sailing. Being left alone in the dark for hours on end with only my own thoughts to entertain me has never really appealed. (What does that say about me?). But over the years I have (almost) come to enjoy these solitary moments. 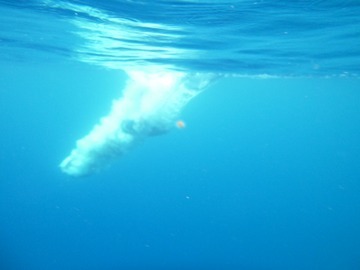 With the full moon and the water moving quickly beneath the keel, it was a trip that I really enjoyed. Which is good, as may be it will be one of the last we have on the good ship Alianna. 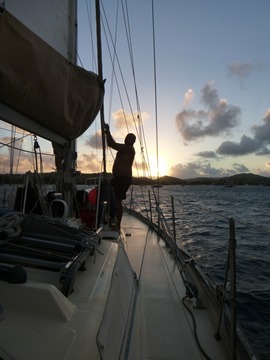 We arrived in St Martin on Saturday afternoon and anchored under sail – a first for us, as the engine wouldn’t start because of a blocked fuel filter. Sim changed the filter later that afternoon and the engine is now purring (roaring) sweetly again. We would like to announce that we are now the proud owners of a new boat. Yikes, even a fleet of boats as we have not sold Alianna. Scary stuff. We are now really pushing for Alianna to be sold. She has been a wondering home for nearly the last nine years; the longest place I have ever lived other than my family home. She has taken me to wonderful places but more than anything she has kept me safe and been my place of sanctuary. 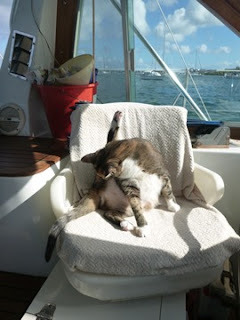 It’s going to take a while to find this familiarity on the new boat but I don’t doubt it will come. I hope that she can give these same things to new owners and look after them like she has looked after us. 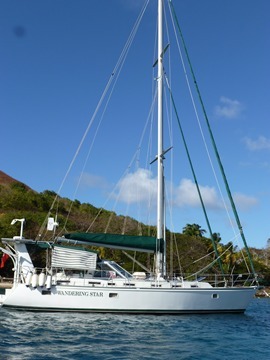 So without further ado….introducing Wandering Star – A 44ft custom design steel hulled boat. 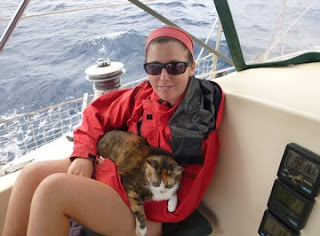 ﻿We have been stuck on the boat for the last 3 days with the winds howling in excess of 30kts. The amount of boats moving about over these last few days has truely surprised us - but some had suffered the consequences, limping in to Portsmouth Bay with tattered sails. 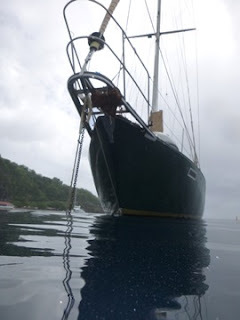 Eventually, feeling fairly confident that our anchor was holding we ventured ashore to stretch our legs. 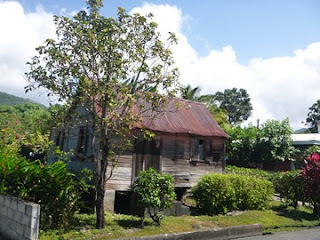 I love walking down the dusty road, it is so pretty with vibrant flowers and cute little houses. 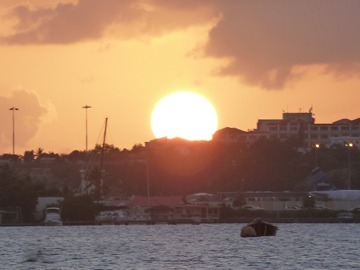 After being in the more civilized St Lucia for so long it was a welcome change of scene. 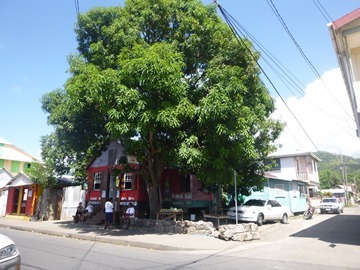 Little stores, shacks and bars dot the side of the road. The Bread Shop sells the odd loaf of bread, and the veggies are truely delicious - dominica being such a fertile island. As long as you like your chicken parts you will always find something meaty to eat from the small supermarkets. 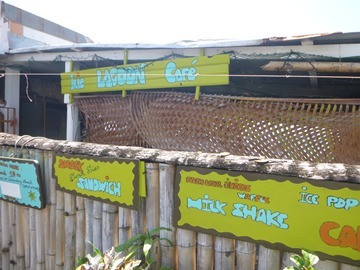 The fried smells that drift out of the small cafes and little eating places are enough to tempt anyone out of a diet. 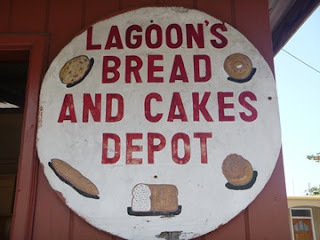 But all we really came ashore for was a loaf of bread. We walked back along the black sand beach, keeping up a march to stop our feet from burning on the hot sand. 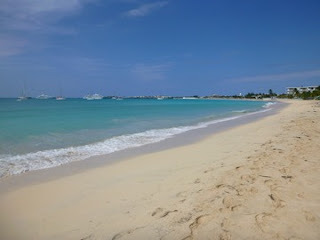 Tomorrow the wind and seas will have died down sufficiently for us to carry on. 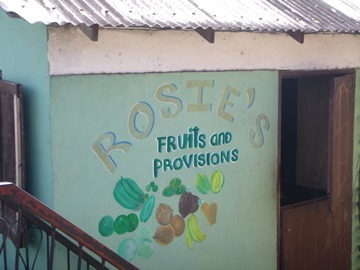 My fruit and veg shop. 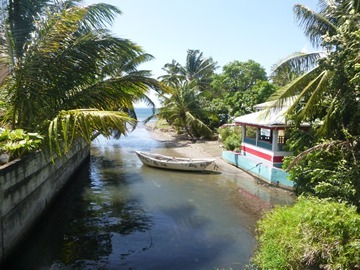 ﻿The handy thing about Dominica is that you can clear in and out at the same time for up to a two week period so there is no need to traipse back down to the customs offices. 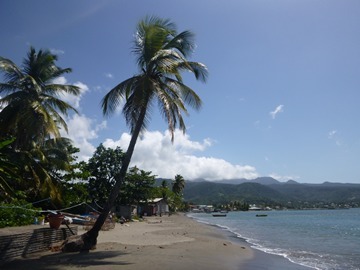 As much as we would like to stay and explore Dominica some more (they have a whole series of hiking trails stretching the length of the island - although I don't think Sims knees are up to it), we need to keep moving up to St Martin and try and get Alianna sold. 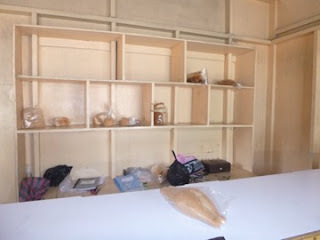 The well stocked bread shop! 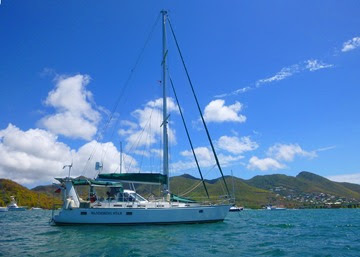 We are now very keen to sell Alianna and so are on our way north to St Martin where our broker Tony at the Little Ships Company is and where we hope to have a better chance of selling her quickly. 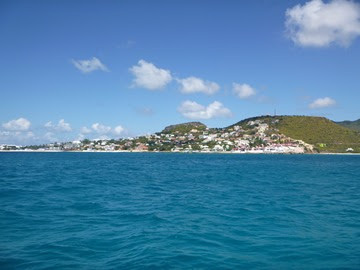 So heading northwards with a small and windy weather window, we left the comfy confines of Rodney Bay behind early on Saturday morning. 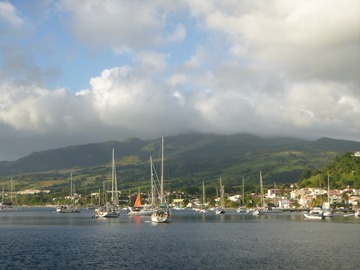 It is only a 45 mile or so trip up to St Pierre at the north end of Martinique but always erring on the cautious side we like to leave ourselves plenty of time to arrive before dark. 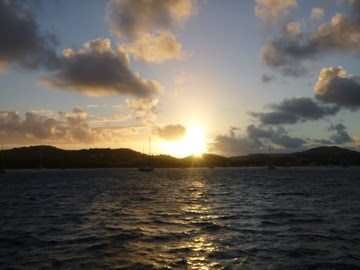 We were up at the crack of dawn, already shipshape with only the sails to pull up and the anchor to haul away. 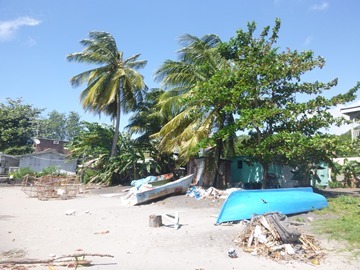 This two day weather window wasn’t the best in the world with force 5-6 winds and seas to accompany. Alianna was reefed down with just half a headsail and two reefs in the main. 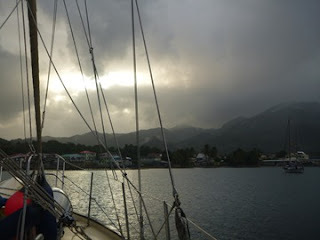 It was a bumpy ride across the St Lucia/Martinique channel. Alianna was surfing the waves, disappearing down troughs only to rise up again on the crests. One minute my view would span the world the next a wall of water. The wind was howling a good 25+kts and Alianna was stonking along loving every minute of it. It was an exhilarating ride, not one I like to do for very long but it certainly blows all the cobwebs away. Thankfully the seas died down as we came into the lee of Martinique and we had a beautiful sail in the flat waters all the way up to the pretty anchorage at St Pierre and below the always awesome Mt Pelee. 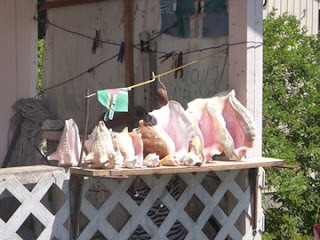 It was the same procedure the following day, up at the crack of dawn for the 55 miles to Dominca. Another bumpy ride for slightly longer as this channel between the islands is wider. 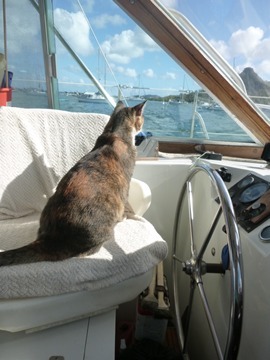 But again Alianna sailed like a trooper. 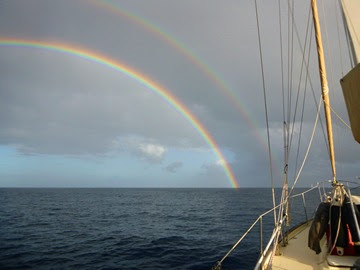 Double rainbows and dolphins entertained us. 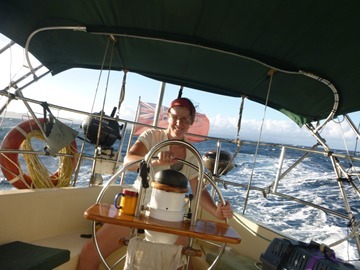 It’s so wonderful to be sailing again after being immobile for so long. The sense of freedom it evokes is indescribable. We are now anchored in Portsmouth Bay, Dominica. 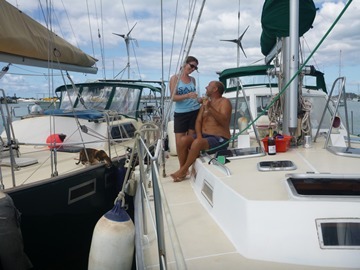 We have anchored and re-anchored and….re-anchored again as the holding is notoriously bad but as we are going to be holed up here for a few days while force 7 winds blow through we want to be happy that our anchor is secure. The boat boys have been out and greeted us; it can get rather annoying when they hang off the sides while you are trying to anchor. But they are only trying to earn a living. Sim has cleared in. We will now wait for this weather to pass through before we carry on north to St Martin. Sim having a quick cuppa b4 we head out. T'was a wet and windy trip. with the wind in my hair!